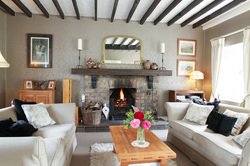 The main guest lounge is in the oldest part of Shola Coach House B&B, and with its original oak beams and high ceiling, was used to accommodate the coaches and horses in the bygone days of Portrush. Today, with its linen upholstery, comfy cushions and sofas, you will be as snug as a bug as you sink in, or curl up, and relax in front of the open fire. On the long, fine Irish summer evenings you can enjoy the peace and tranquillity of the courtyard and gardens accessed through the lounge’s French doors. In addition there is a cosy wee nook on the upstairs landing where you can read from our wide selection of books and magazines, build a jigsaw, play a board game or select a DVD/CD to enjoy in your bedroom. Throughout the house you will see a mix of traditional antique and contemporary furniture as well as unique and quirky curios we have collected from our travels around the world including pottery from Peru, artefacts from Africa and Aboriginal art from Australia. 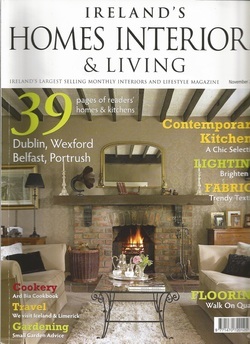 Left - Shola as featured on the front cover of the November 2012 edition of Ireland's largest selling monthly interiors and lifestyle magazine.